AS THE election of 2016 lurches to an unmourned end, it feels cruel to report that the presidential race of 2020 is already under way. This haste makes sense, at least on the Republican side. If voters on November 8th consign Donald Trump to a life of brooding defeat, filled with cable TV interviews, restless travel and insomniac tweeting, he will leave a party primed for civil strife. For a tough dilemma confronts Republicans. Full-blown Trumpism—a retro creed that blends America First nationalism, paranoia worthy of Joseph McCarthy, George Wallace-style nativism and Hugh Hefner-ish lechery—is a recipe for losing a national election. Yet without those voters who hear and see a champion in Mr Trump, Republicans will struggle to win most other elections, whether to Congress or at state level. Mr Trump has revealed that, for many, conservatism is as much an identity as a set of principles. Mr Trump could not care less about shrink-the-government orthodoxy. He blithely opposes moves to reform federal aid for the old, despite its spiralling costs. He promises such expensive schemes as a federal deportation force targeting “criminal aliens”. Mr Trump doubts that American leadership is needed to keep the world safe, questions alliances like NATO, denounces George W. Bush for invading Iraq and praises Russia’s autocratic president, Vladimir Putin. His threat to slap tariffs on Chinese or Mexican imports mocks Republican leaders who back free trade. On October 8th Senator Tom Cotton of Arkansas, a 39-year-old star of the doctrinaire right, arrived in Iowa for a four-day visit. In theory, Mr Cotton was in Iowa to campaign for Republicans who, unlike him, are up for re-election this year. But politicians do not visit Iowa by accident. Its caucuses are the first winnowing contest of the presidential primary season. Those with White House ambitions must spend months wooing the state’s farmers at county fairs, and its evangelical Christians at church pancake breakfasts. While in Iowa Mr Cotton addressed two party fundraising dinners whose previous speakers include most major Republican presidential candidates of the past decade. On paper, Mr Cotton is an unlikely figure to reconcile Mr Trump’s burn-it-all-down followers with conventional conservatives. The son of a cattle farmer, he is a beakily intense six-foot-five-inch Harvard law graduate and former McKinsey consultant, who enlisted in the army in 2004 and served as an infantry officer in Iraq and Afghanistan. He was elected to the Senate in 2014, after a brief stint in the House of Representatives, with the help of two distinct bands of admirers. First, anti-government groups such as the Club for Growth, who hail his willingness to vote against disaster-relief funds or food stamps (Mr Cotton talked of recipients with new cars and “steak in their baskets”). Second, foreign-policy hawks, who cheered when, two months after entering the Senate, he wrote to Iran’s leaders, warning them that any nuclear agreement they struck with President Barack Obama might be overturned by Congress—a letter that made Senate veterans wince, though 46 other senators eventually signed it. Mr Cotton is a hardliner on law and order, too. This year he helped block a bipartisan criminal-justice bill that would give judges more flexibility when sentencing, among other reforms meant to address decades of soaring jail populations (America, with less than 5% of the world’s population, accounts for almost 25% of the world’s prisoners). Mr Cotton argued in May that because most crimes go unpunished, “if anything, we have an under-incarceration problem”. Elections turn on many issues, he goes on, but the one issue on which Mr Trump differed from almost every Republican he beat in the 2016 primary was immigration. Mr Cotton supports Mr Trump and is sure that a key to navigating an era of “populist insurgencies”, from Britain to continental Europe and America, lies in acknowledging the “reasonable, legitimate concerns” of working families about low-skilled migration and its effects on society and on wages—even if a “transnational cosmopolitan elite” is left unscathed by them. Addressing the party faithful, moments later, Mr Cotton presented himself as a member of the generation moved by the patriotic spirit that America showed after the September 2001 terror attacks, leaving civilian careers to join the army and learn a “warrior ethos”. He combines that pitch with Trumpian vows to secure the border and reject a “new normal” that, he says, sees riots on the streets and “cops assassinated on the beat”, while sneering liberal elites “live behind high walls with armed guards”. After the speech Jeff Kauffman, chairman of the Iowa Republican Party, reported praise from the party faithful for Mr Cotton’s “freshness”. The challenge for his party, whatever the result in November, is to keep the new voters brought in by Mr Trump and to capture his populism, “but package it so it is more mainstream”, Mr Kauffman says. 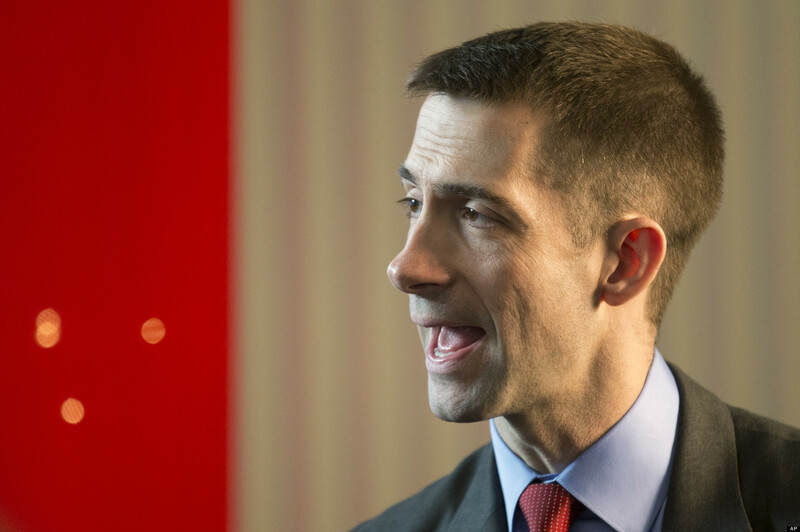 Between now and 2020, expect to hear more about Tom Cotton—and about other, rival Republicans with schemes to make American populism mainstream again. Even in defeat, Mr Trump will shape the party’s future.